Please allow me to introduce you to the newest members of our international team: Tadej Francelj from Slovenia, Jekaterina Titova from Russia, Georgi Georgiev from Bulgaria and David Meszaros from Hungary. 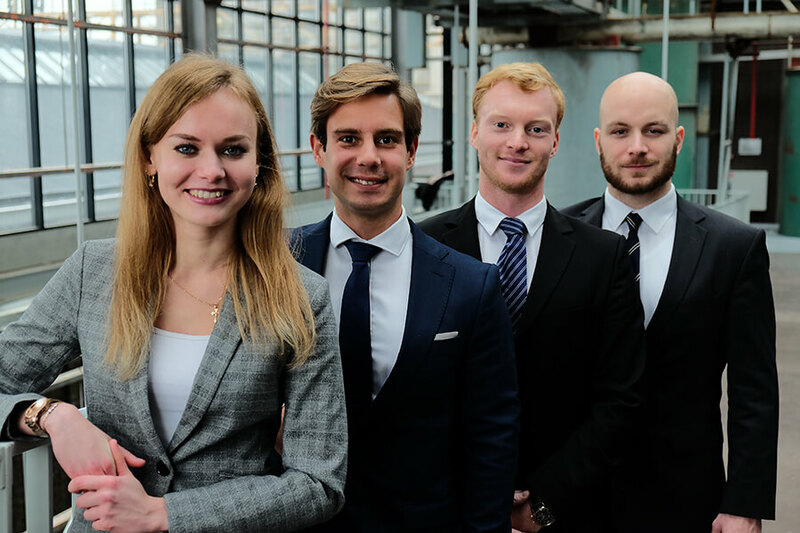 As judicial systems and business traditions differ substantially from one European country to another, we have asked our trainees to share their knowledge on this topic. Each country has its own ways of dealing effectively and successfully with its defaulting debtors. Being aware of the traditions and judicial systems in Eastern Europe will help your organisation when conducting business with an Eastern European company. Russian Jekaterina agrees that Dutch people are more direct than Russians. She has also observed that people in the Netherlands are more demanding, and she was surprised to learn that Dutch people want to know every detail about a case, even if the outcome is unfavourable. “That is somewhat different in Russia,” she says. “Russian companies try to conceal negative information for as long as possible, whereas Dutch companies want to know everything there is to know.” She adds that a lot of Russian companies have an unscrupulous business mentality, which can complicate doing business with Russians. This does not apply to Slovenian businesses, though. Although Slovenian business partners will always try to negotiate on the price, they generally do adhere to their business agreements. In Hungary, the way of doing business depends on the geographical location of the company. “There is a difference between companies located in or around Budapest and businesses located outside of the capital. The main difference is the way they do business,” David explains. “Outside of the capital, companies mostly act in accordance with the traditional Hungarian business culture: companies conduct business with a select group of other Hungarian companies and may have a somewhat hostile attitude towards foreigners,” David adds. “Companies outside of Budapest are somewhat easygoing about agreements and deadlines and it is normal for these companies to pay invoices later than agreed upon. This merely happens because life outside of the capital is relatively relaxed.” However, the majority of Hungarian companies is located close to Budapest. The business mentality in and around the capital is characterized by its rapid pace and international mindset. In Russia, companies do not adhere to the agreed upon terms of payment, unlike Bulgarian and Slovenian companies. Jekaterina therefore advises international companies to be strict and demanding towards Russian debtors. She says that the best way to contact your Russian debtor is by telephone rather than by sending a written reminder. “Personal contact is preferred by most Russian companies. When calling your Russian business partner, you will know that your message reaches the right person,” Jekaterina explains. “If you send an email, your Russian debtor might claim that he or she was not aware of the overdue invoice, so calling the debtor is more effective,” she continues. However, you must be aware of the fact that you are not allowed to contact your Russian debtor too many times. As of August 2016, a new Russian law has been enacted which states how many contact moments are legally allowed between the creditor and debtor. Our Hungarian trainee, David, also advises international companies to contact debtors by phone, even though Hungarian companies primarily communicate through email. “Most communications happen via email. In some cases, calling might even be perceived offensive,” David says. “But when you are facing a defaulting debtor, I would advise you to contact that company by telephone.” Tadej states that this is equally true when dealing with Slovenian debtors. He adds though that it is best to remain friendly towards your Slovenian partner. Georgi from Bulgaria says that in his country it is necessary to remain demanding and strict towards your debtor, “In my country you should write an official reminder to your debtor, because this is a more official and demanding way to urge your debtor to pay.” In Russia, they go even further, as each document to the debtor should be officially stamped. “This is common in Russia, but for most European companies this is rather strange,” Jekaterina tells us. It shows that dealing with Eastern European debtors can be challenging. Knowledge of the legal system and language of the country of your debtor is extremely useful when facing a defaulting debtor. If you would like to receive further information on debt collection in Europe, please do not hesitate to contact Bierens. We would be happy to be of assistance to you.